"TOYS OF MY PAST": "Halloweens Past"
I can’t wait for that one Halloween day when I get asked “Daddy are going to dress up too” and then I’ll have to dress up and go trick or treating with my daughter, I’m going to hate it…….YEAH RIGHT! 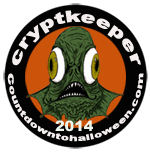 As I write this I am thinking of all the cool things I can be and what costumes I wore as a kid back in the day. I can only think of a few, I went as The Crow one year in my teens and……….umm……wow… my trick or treating sucked I guess, well I do for some reason remember dressing up as a Teenage Mutant Ninja Turtle. 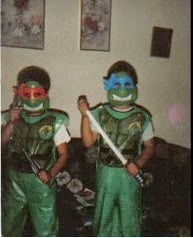 Yeah that’s me as Leo and my cousin Robert as Raph and one thing that I remember is that those costumes were only meant to be worn once and only once because by the end of the night they were barely hanging on by whatever plastic it was made of or had fallen off and stuffed in your candy bag if it fit with all that awesome candy you had, I mean the dang candy bags were made better than the costume itself. 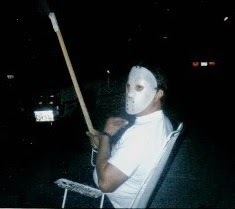 But Halloween was always fun in our family wither you dressed up or not because everyone got into the spirit like my dad, he would just sit there at the end of the drive way and scare kids with just a mask on…now that’s talent. Even my grandma would sometimes join in on the fun. 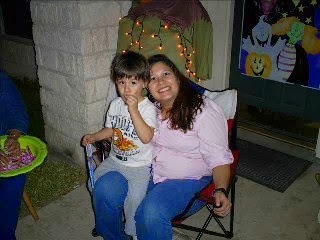 That’s my sis and her son Chucks eating the candy for other kids……I taught him well.